Caucasian passions in the Far East are no novelty on the screen, but the achievement of ‘China Seas’ is that it makes events not only exciting but credible. China Seas indeed has a rather predictable plot. A seasoned captain of a vessel sailing from Hong Kong (exotic setting no.1) to Singapore (exotic locale no. 2)? Check. A love triangle between his former girlfriend, China Doll, and his new love, refined lady Sybil Barclay? Check. Asian pirates taking over control of the ship? Check. Despite the familiar plot, the combined attraction of Clark Gable, rising star of Metro-Goldwyn-Mayer who would later go on to star in Gone With the Wind, and Jean Harlow, touted as MGM’s next Greta Garbo, under the masterful direction of Tay Garnett, seems to have been enough to inject novelty into a tired old cliché. So much so that this following American reviewer was willing comment that the “wild southeast coast of Asia, called the ‘last frontier of the seven seas” was “now for the first time made use of for motion picture purposes”. While it seemed to be well received in US, it was not as popular in London, the metropole of the colonial power governing both Hong Kong and Singapore. Despite the film’s glaring departure from reality, however, this London correspondent was willing to promote it with a line (which, incidentally, aptly sums up malayablackandwhite thus far): “It may be rot, but don’t miss it”. Malayan audiences, however, did not enjoy the luxury of hate-watching this particular blockbuster. 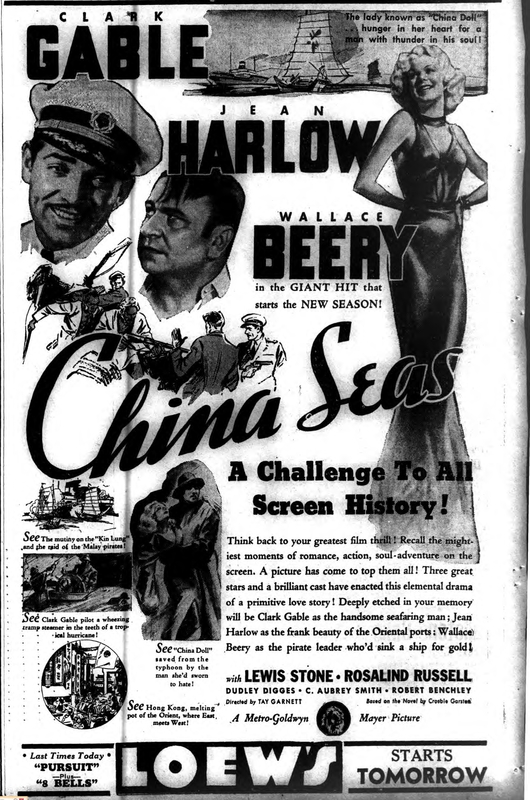 Not least because the Colony Film Censor, T. M. Hussey, decided to ban the film in British Malaya, citing “piracy in China Seas, torture scenes, violation of women by pirates” as the reasons. Clearly, Malayan audiences were tired of Hollywood’s inaccurate portrayal of the place they called ‘home’ (temporary, in most cases, but still home nonetheless). When Tay Garnett arrived in Singapore in 1936 to shoot scenes for Trade Winds (later released in 1938) and Singapore Bound (which did not appear to be made), in a rare case of solidarity, newspapers did not criticize Hussey’s censorship. Instead, they lauded that “ban on film in Singapore teaches Hollywood”. And it is little wonder that Hollywood films set in Malaya couldn’t care less about factual accuracy. An interview with the screenwriter, James Kevin McGuiness, reveals that ‘I think most writers get the best ideas just as they’re dropping off to sleep’. And on the process of coming up with a action-packed thriller? The locale was simply not a key concern for screenwriters then. As the London correspondent for Straits Times said, ‘Boy, it may be inaccurate but it’s terrific stuff. Try a dose and see’. Don’t miss the screening of China Seas, or La malle de Singapour (the French title is much closer to heart) to watch this film previously banned to Malayan audiences in 1930s! 7pm, 20 Feb, Wed, at NUS Museum.